Top is now finished; I have left the original St Michael label intact as for me this is part of the heritage of the upcycled garment; the back V neckline scoops nicely as the top is bias cut; ... and this lovely top from just one vintage scarf! What a great idea. I have just tried this but with a larger scarf. It was tricky because of the bias cut and slippy fabric, but rewarding. Oh great, thanks for letting me know you gave it a try & glad you enjoyed it. I know what you mean about the slippy fabric, but I am always amazed how successful sewing with scarves on the bias can be. Hello, its me again, you can see my version of your scarftop at https://whatthesew.wordpress.com/ I have added a link to your blog and will also be posting on refashion co-op probably later today. Thanks for the inspiration. Thanks for your kind comments, glad you like the projects. Am currently working on a big blog overhaul so more projects coming soon! 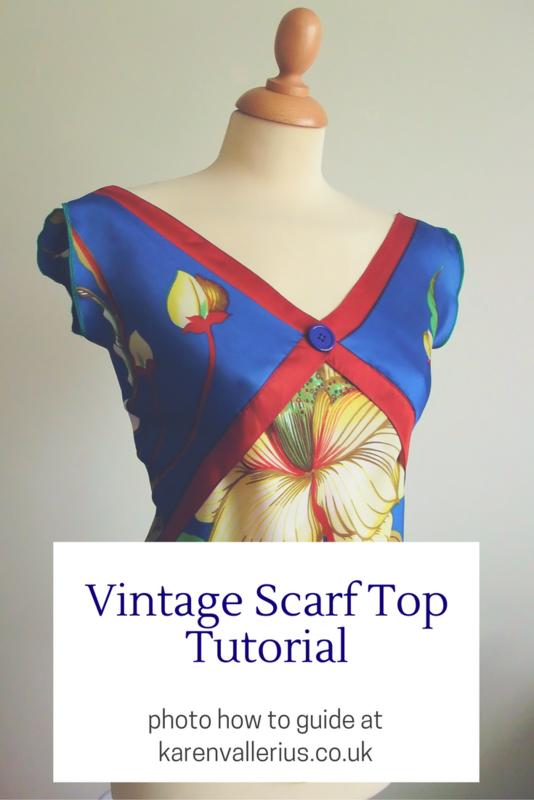 PS love your version of the top, really fab, and what a lucky find with the patterns!!! Such a clever refashion - thank you!